Achievements in games are assumed to be extrinsic motivators yet this has not been shown to be the case experimentally. This study attempts to determine whether achievements exhibit characteristics more closely related to intrinsic or extrinsic motivators. An experiment was conducted in order to examine the effects of Achievements in a controlled environment. It was found that Achievements show no strong correlation with intrinsic motivation. 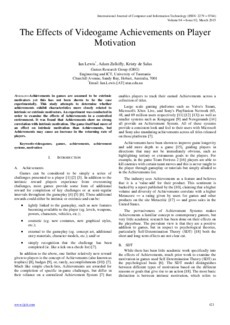 The game itself had more of an effect on intrinsic motivation than Achievements, but Achievements may cause an increase in the returning rate of players.